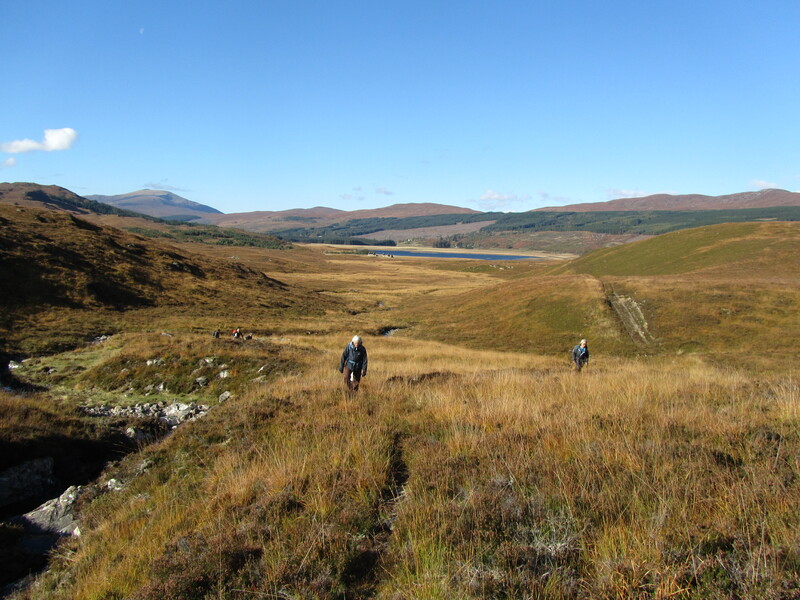 What is believed to be an old droving route from Badinluchie, south of Loch Achanalt in Strath Bran, to Dalnachroich in Strathconon was followed by several NOSAS members on a sunny day in October. The Roy map of c1750 has two roads from the east coast to the west through Ross-shire, one through Strathconon and one through Strath Bran. At this time they would hardly have been roads but more probably bridle ways easily traversed by ponies; a road from Contin to Poolewe through Strath Bran first appears in the records about the year 1760. From the late 1700s, and probably even earlier, communication with the Isle of Lewis passed through the tiny port of Poolewe, cattle were shipped from the Islands to join the droving routes which led eastwards to the tryst at Muir of Ord; John Knox was to report that he sailed from Stornoway to Poolewe in a small unworthy vessel used for the transport of cattle (Tour of the Highlands and Islands 1786). Cattle export was to reach its height in the early 1800s during the Napoleonic Wars. 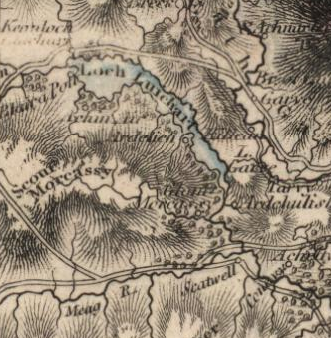 The main route by which the drovers headed east for Muir of Ord was via Loch Maree, Achnasheen and Strath Bran, although there were other routes to the north. Maps of the late 18th and early 19th century – John Ainslie 1789, Arrowsmith 1807 and John Thomson 1832, indicate a branch road heading south over the hills from Achanalt in Strath Bran to Strathconon via “Baud Leuchie”; this route would have made eminent sense for drovers wishing to avoid hazardous river crossings on their way to Muir of Ord. This entry was posted in General Archaeology, Post Medieval, Strathconon and Ross-shire and tagged archaeology highlands, archaeology Scotland, Badinluchie, benchmarks, cleared village, drove road, droving, highland archaeology, MacKenzie of Seaforth, Meryl Marshall, North of Scotland Archaeological Society, NOSAS, Osgood Mackenzie, Post Medieval archaeology, rig and furrow, ross shire, Roy map, Scottish archaeology, Strath Ban, Strathconon on December 31, 2014 by nosas.